"Arrive as guests. Depart as friends." That phrase could have been written specifically for the family run Colonial Lodge in Suva. Owned and operated by Suzie (along with able assistance from Biu, and the two dogs Ben and Bruno), this place just oozes personality. Situated close to the hospital and the CBD, this makes an ideal place to stay for a few nights (or longer) if you want somewhere nice and quiet, yet still close enough to be able to walk to everything. 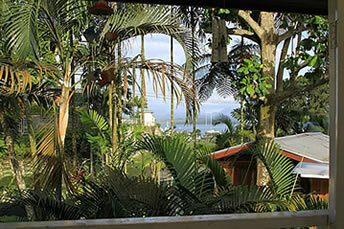 With lots of bamboo and mature trees for privacy, it's hard to believe this is in the heart of Suva. Popular with interns at the local hospital (the Colonial War Memorial), they also cater to long term stays as well. Just send Suzie an email, and she will be happy to let you know what's available, and give you a price. A comfortable and homely feel. 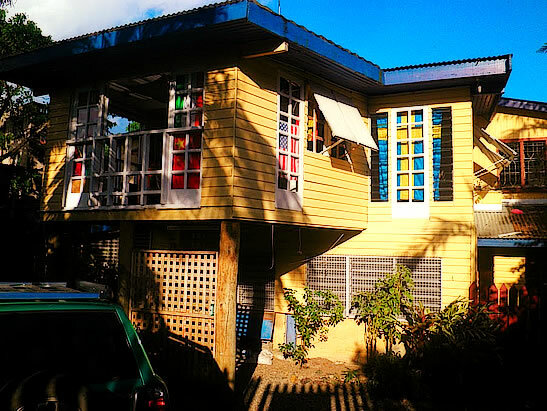 The rates start from as low as fj$28 a night in the 6 bed dorm, breakfast included. There are a range of rooms available, from the dorm, through to a family room that can sleep 4 at fj$100 a night. All room rates include a breakfast... if you want dinner as well, you can order one for fj$14 (try eating cheaper than that in town!). They can also sell alcohol to room guests, or just bring your own. 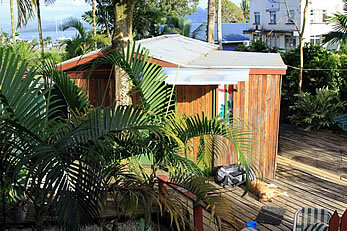 Most of the cheaper rooms have shared bathroom facilities, although there are some self contained double rooms with en suites, priced at fj$66 a night for two people. Breakfast: Choose from eggs, porridge, cereals, homemade pancakes and jams, puddings, fruits, toast, tea or coffee. Dinners: These are a variety of local and foreign dishes and is usually buffet style. Much of the fruit and veggies are homegrown and freshly picked from the gardens. Wi-Fi: This has been recently installed. You get 30 minutes free each day, and can purchase further time at fj$5 an hour if you need it. 19 Anand St, any of the local taxi drivers will know how to get there. If you are arriving at Nausori airport, Suzie can arrange a taxi to pick up (and drop off when you leave). The taxi fare from the airport is fj$30. 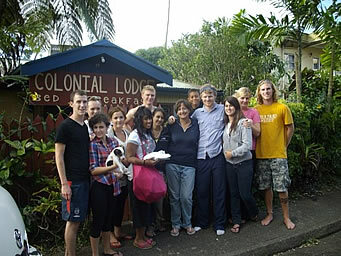 A big friendly "BULA" from the guests at Colonial Lodge. A beautiful view over the harbour area from the living room. Bruno (or Ben) asleep "on duty". This is one of the outside accommodation rooms.